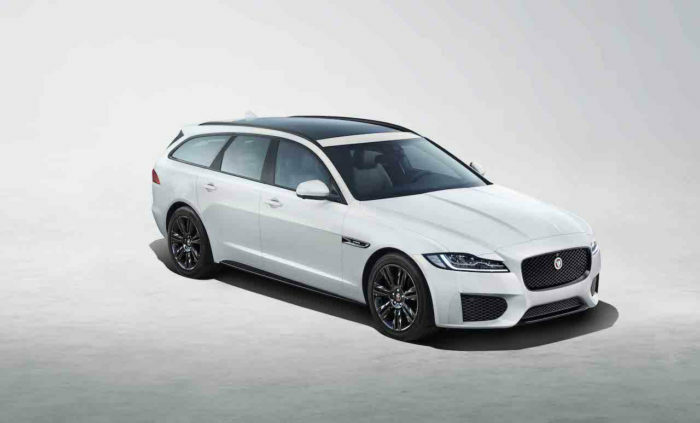 The Jaguar XF sedan and its family body version, Jaguar XF Sportbrake, have been on the market for some time. Now, with the aim of improving their sales and remaining competent in their respective segments, a special edition arrives. This is the Jaguar XF Checkered Flag, which would be translated as “checkered flag” and that has a good number of specific elements to differentiate itself from the rest of the specimens. On the outside these Jaguar XF will have 18-inch wheels in glossy black, which will match the rest of the elements of the Black Pack. A sportier front bumper, rear spoiler or a special edition badge on the side are also added. These Checkered Flag can be chosen with three body colors: the Eiger Gray (with which the saloon is shown), the Yulong White (worn by the relative in the photos) and the Santorini Black. There will also be important developments inside these models. The seats receive the striking R-Sport upholstery and Dark Hex aluminum trim. There will be two color combinations, Jet / Jet or Jet / Red. The equipment will be as complete as it comes with advanced Navigation Pro navigation with In Control Connect Pro on the 10-inch touch screen, as well as 12.3-inch digital instrumentation or keyless access and start-up. The range of engines available for these Jaguar XF Checkered Flag is quite complete and includes five possible options. In diesel is the Ingenium four-cylinder and 2.0-liter with 180 HP (rear or total traction) or 240 HP (AWD only). Above is a 3.0-liter twin-turbo V6 with 300 HP and rear-wheel drive. For the part of gasoline is the Ingenium four-cylinder and 2.0-liter with 250 or 300 HP, and can choose traction in both cases. The prices of this version part of 60,450 euros in the case of the saloon and 65,550 euros in the case of the relative.